A new RIB was a poor match for a tooothy fish. My wife and I commanded the Harbinger from 1994 to 1996. 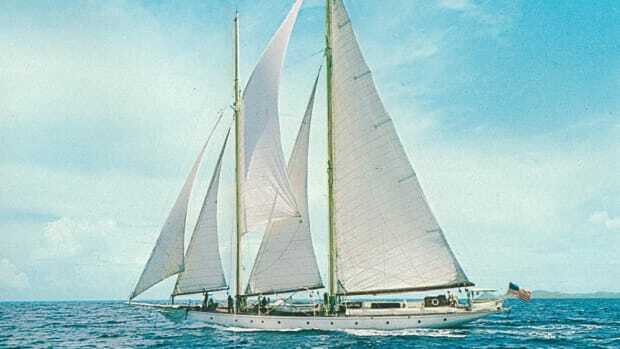 She was the epitome of a classic sailing yacht, with enough brass and varnish to keep you going full-time. 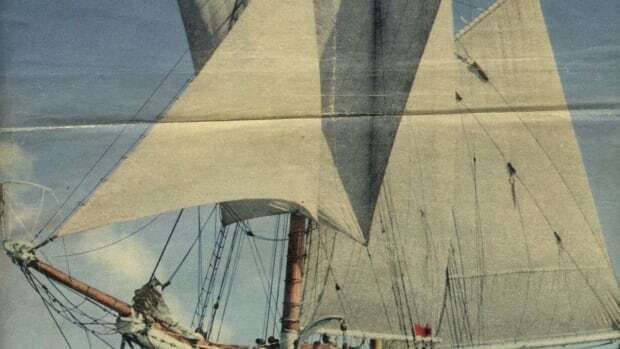 From the long bowsprit to the graceful counter stern, her sheerline was perfect. Her 120-foot-tall main mast seemed to pierce the sky. 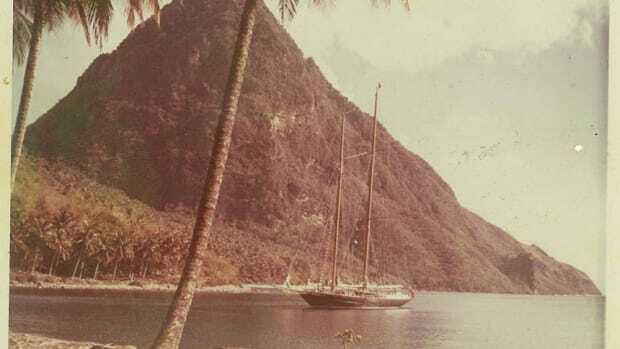 At 117 feet long with a tonnage of 105, she was a big, heavy, ketch-rigged yacht. 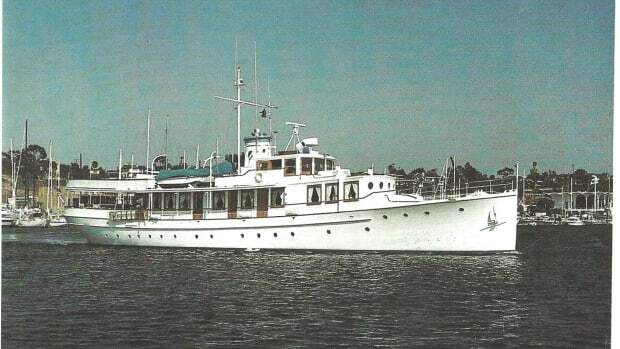 Stow & Son in Shoreham, England, built her of teak in 1913 for a Scottish duke. The fact that she lived so long is a testament to her builders. She has outlasted them all. 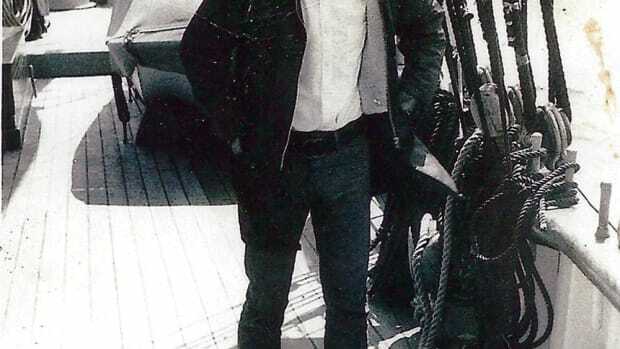 With a crew of seven, I sailed Harbinger to Venezuela in August 1994. My wife, Sarah-Jayne, flew out a month later from England, and we spent eight months at a shipyard rebuilding her. After major work on her hull, the painters sprayed white on her topsides, which glistened in the tropical sun. 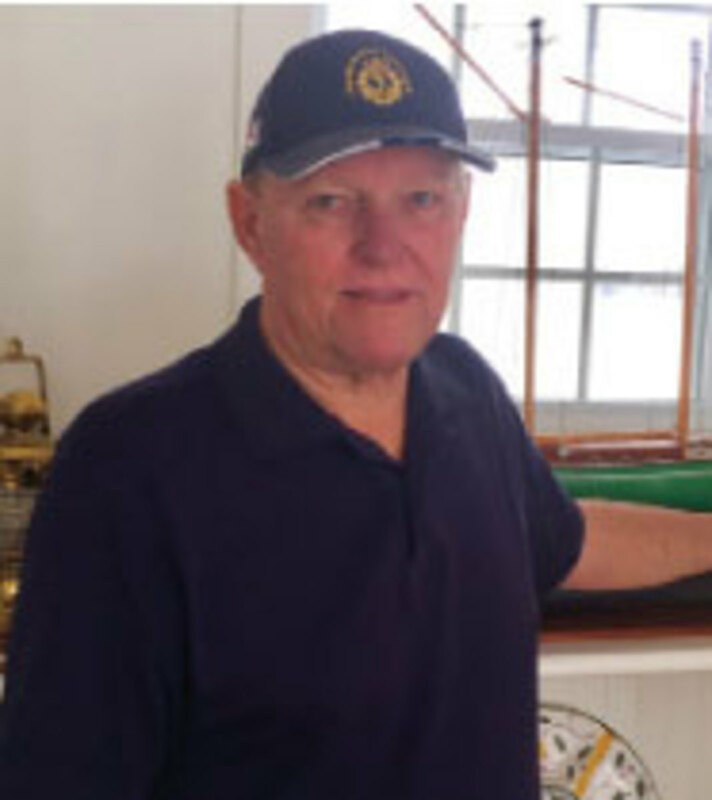 Skilled tradesmen worked on rigging and sails, and repaired or replaced faulty equipment. Finally, after a mechanical rebuild, she was ready for sea trials. While we were there, the owners decided to replace the aging inflatable Avon speedboat. 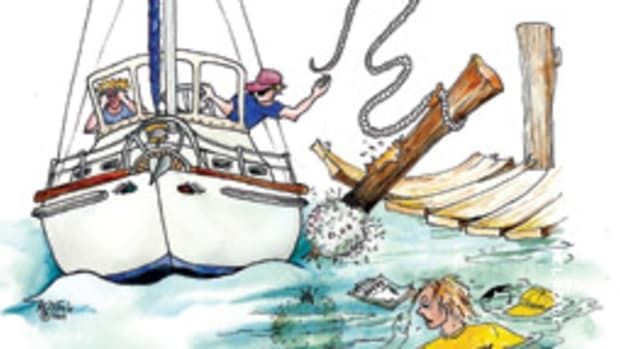 On a yacht, the tender is an important piece of equipment. It carries passengers and crew back and forth to shore. It goes grocery shopping and brings laundry aboard. 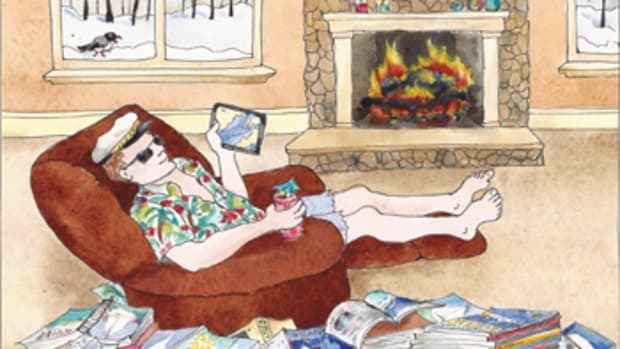 It takes guests water-skiing or fishing, and ferries them ashore for drinks or dinner. Although the Avon was a good make, our poor thing was just worn out. It lost air all the time. Despite continuous patching, there was no stopping the bow compartments from deflating. 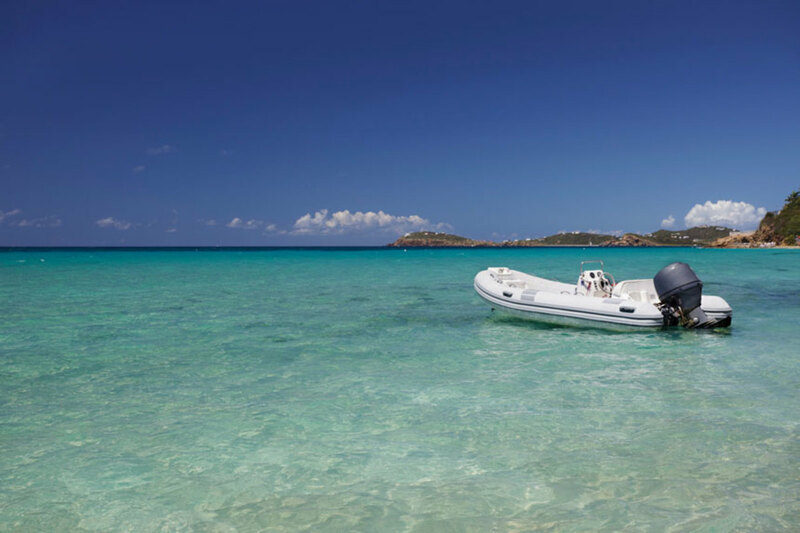 With the owner’s blessing, I selected a 17-foot Caribe RIB with a 60-hp outboard motor. It was a real treat to ride in this splendid new boat with the steering console amidships. The owner of the yacht loved it. It was his personal toy. He would speed around for hours, going nowhere in particular. 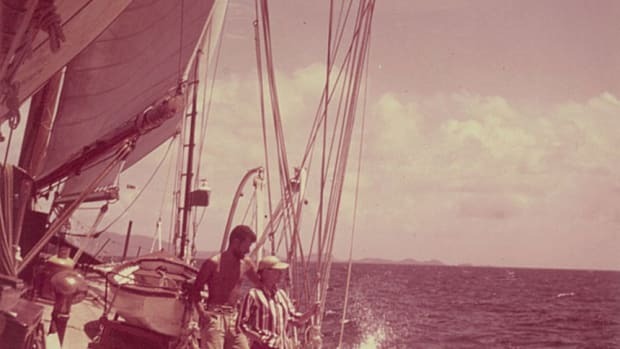 In December 1995, we took the owners and their friends on a cruise around the British Virgin Islands, stopping one day at the picturesque Bitter End anchorage on the island of Virgin Gorda. Hans, one of the owner’s friends, was keen on fishing, so I organized an expedition. Early the next morning, we took off in the inflatable toward the reef surrounding the north end of the island. The sun was rising into a clear blue sky. It took us only 15 minutes at full speed to reach the outside of the reef, and then I slowed down. We could see the sandy bottom through the crystal-clear water as it joined the edge of the coral, while farther out it sloped gently into the deep. Small fish near the surface darted away as we cruised along, and deeper down was the occasional larger fish. I had a good feeling as I set the rod up for Hans and we began trolling. Hans was the impatient type. After only a few minutes, he began to give me a bit too much unsolicited advice on how to catch fish. Hans had never been to the Caribbean, but I changed “zee lure” anyway. After about half an hour of steady instructions from Hans, he got a big strike. The fish bent his rod over and peeled off yards of line. “I get zee fish!” he shouted. Hans didn’t like to be told too much about how to catch fish in the Caribbean. After all, he was the expert now. As I gave Hans unwanted advice and helped him with the drag, he slowly reeled in his catch. It was heavy and pulled line back out every moment or so. After 20 minutes, we could see a long, silvery shape in the azure depths. It was a barracuda, perhaps 5 feet long. 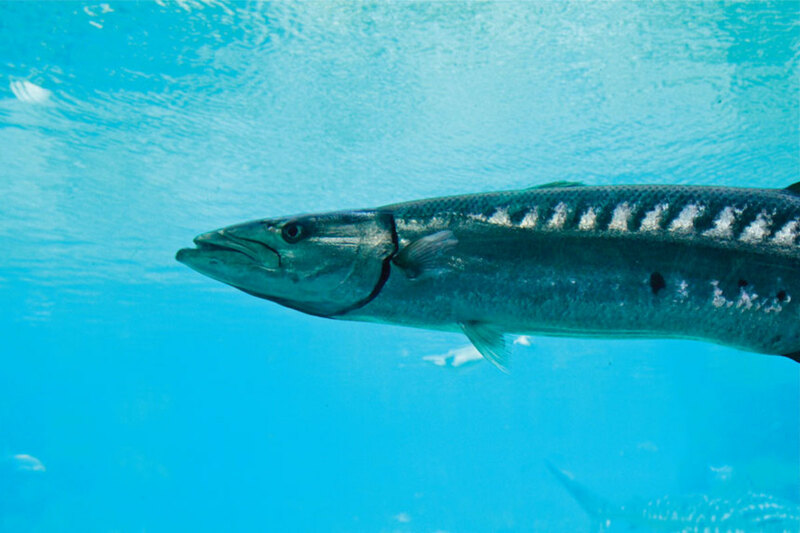 When a guest hooked a barracuda off Virgin Gorda, things got interesting. Hans sounded a little concerned. “No, Hans, he’s not dangerous, just as long as you keep your fingers out of his mouth,” I said, smiling to myself. Hans continued reeling, and I steered the boat until the barracuda was just below the surface. I grabbed the gaff. “Just bring him up a little more, and I’ll gaff him,” I said. Hans wiped his brow with the back of his hand and cranked a few more turns on the reel. Suddenly, the barracuda disappeared under the boat. A moment later, we heard a loud hissing sound. Then, a fizz of bubbles came up from under the boat, along the side. The damned barracuda had bitten at the rubber pontoon and drawn air, which was now rapidly escaping. Hans looked over at me, confused. I certainly didn’t need Hans to tell me that bubbles were coming. I was more concerned about whether or not we were going to drive or swim home. The air was escaping at a surprising rate, and the port side of the Caribe was deflating. I opened the compartment under the seat and pulled out the air pump, then plugged the hose into the intake port. “Hans, you pump this as fast as you can while I try and drive us home,” I said. I stuck his rod in the holder, and he worked the pump handle as fast as he could. As we limped back to the Harbinger, Hans kept glancing over his shoulder to see how far we still had to go. I couldn’t go fast because one side of the boat was dragging. At some point, I noted that we were going to make it, but I said nothing. “Keep pumping, man,” I said, feigning a worried look. Hans had worked up quite a sweat, but he redoubled his efforts. I confess that I was having a little fun with him to get even. We came alongside Harbinger to find the owner and his friends, as well as the crew, lining the rail. My boss wasn’t too happy about the tender. He had spotted Hans’ frantic pumping from a ways off, and now saw the bubbles. I had managed to put a hole in his new speedboat. he was thinking the same thing. He turned to Hans and spoke rapidly in German. Luckily, Hans saved the day. Smiling, he grabbed his fishing rod from the holder and started to reel in. The rod tip twitched and bent again, and as the last 20 feet came in, the large, limp barracuda appeared at the end. Somehow, it had stayed hooked. making sure he kept his fingers away from the wicked-looking teeth. He glanced at me with an “I told you so” look. “You see capitan, zee lure with zee green spots was correct, ya?” He then began talking in German with the owner. I managed to pick out a couple of words. “Capitan Lou” and “barracuda” popped up regularly. souvenir and he was placated. He was even happier later in the day, when we put his patched toy back into the water. It’s probably just as well that he was aboard when this incident took place. I wonder if he would have believed me had I called on the phone to inform him that a fish had bitten a hole in his speedboat.